Rep. Devin Nunes (R-Calif.) might have found Russian collusion. Russia is secretly funding the environmental movement, particularly in Germany, to help pressure the closure of nuclear power plants, he claimed during the latest episode of his personal podcast. "You still have the nuclear movement going on, the anti-nuclear movement going on, and it's the Russians, the Russians are financing the green movement to have Germany shut down all of their nuclear power plants," Nunes said in the podcast last week. "Why? So that Germany will have to buy Russian gas." German Chancellor Angela Merkel announced in 2011 that the country would seek to close its nuclear power plants by 2022 after a tsunami swamped the Fukushima Daiichi plant in Japan and caused a disaster. 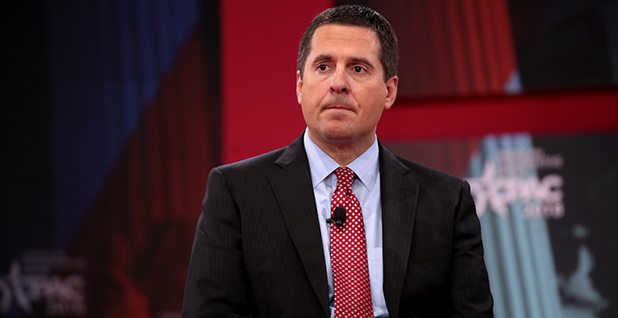 Nunes, as chairman of the House Intelligence Committee, has worked to support President Trump during Robert Mueller's investigation into possible collusion between the Trump presidential campaign and Russia. In the podcast, he did not talk about Russia's interference in the American electoral system, including in the upcoming midterms, but instead attacked climate science and environmentalists who are worried about California's record wildfires. Nunes repeated a common talking point based on a fake Time magazine cover that has circulated online among climate conspiracy theorists for years. The mocked-up magazine cover claims that the planet was cooling. "When I was a kid, we were having global cooling, and we were going to go into another ice age, and now we've switched it to now the Earth is warming," he said. The fake magazine cover made its way to Trump's desk after deputy national security adviser K.T. McFarland placed it there, Politico reported last year. While a handful of researchers looked at global cooling in the 1970s, climate scientists found evidence before then that planetary temperatures were climbing. On the podcast, Nunes and co-host Ray Appleton, a local conservative radio host, joked with their guest, Bruce Thornton of the Hoover Institution, about green groups. They called environmental activists "watermelons" because they are green on the outside but red on the inside like communists. They also talked about how global warming did not contribute to California's devastating wildfire season. "I can't say it's global warming because I don't know if anybody knows global warming, as they understand it as human-caused, exists, but certainly what is happening in the forests or what has happened for millennia in this area, what caused it are not alone, was a shift in forest management starting in about the '70s with the environmental movement, Earth Days, federal laws, species protection, etc.," Thornton said. Forest management can contribute to fires. But scientists say rising temperatures, human development and long-term drought conditions also fuel extreme wildfires. Nunes also mocked former President Obama for connecting climate change to California drought. Nunes has long pushed for the diversion of water from Northern California to farmers in his Central Valley district. "Here in the San Joaquin Valley, you can't make this up, but it's important for me to always say, the agriculture mecca of the world, you had President Obama come here and stood on the fertile soil out on the west side of the valley about 30 miles from here and blamed global warming for the reason we were having drought, meanwhile as billions and billions of gallons of water were being wasted away out to the ocean," Nunes said. Nunes' comments refer to government policies that allow portions of river water to flow to the Pacific to sustain endangered animal species. Other portions are used for irrigation. Trump repeated those claims in a series of tweets during an intense period of wildfire activity earlier this summer. Nunes and Trump blamed Democrats for the water policies, but scientists say water resources in the state are increasingly under pressure from climate change.